Bingo Hideout shocked by revelation that Piers Morgan weds Paris! OK Bingo Hideout fans Piers Morgan and Paris Hilton getting married isn’t strictly true and is just a sham marriage for TV cameras, but even in jest what is Paris Hilton thinking of walking down the aisle with the unctuous Piers Morgan. Even though Paris might well be the Queen of the untalented limelight seekers and agree to do more or less anything to get her self-satisfied perfectly made up mug in the glossy mags and on TV surely even she must have more self-respect than to don a wedding gown and exchange rings with Piers? The mock celebrity marriage between the socialite and the Britains Got Talent judge took place in a classy Las Vegas instant wedding chapel, complete with Elvis and Marilyn Monroe lookalikes. The ‘bride’ wore a traditional white wedding gown and the ‘groom’ a rather shiny (and some might say sleazy) navy suit, the sort that an Italian gigolo would feel perfectly comfortable wearing. 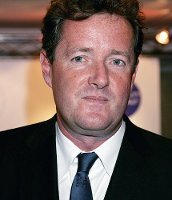 The wedding reported in the Mail shows images of Piers and Paris tying the knot, with the creepy TV personality and newspaper columnist even getting to kiss the bride. The fake wedding really is nothing more than a publicity stunt for a new TV show ‘Piers Morgan on Las Vegas’ in which Morgan delves behind the glossy façade of Las Vegas. The show covers everything from casinos, the glitz and glamour and of course the sleaze right up to the attempts by some of the big names in Las Vegas to become more family friendly. Some might say that Piers and Paris would make the perfect happy couple, both equally enamoured with their own reflections and self-importance, so what do our Bingo Hideout readers think? Both Piers and Paris are Marmite, but love or loathe Paris Hilton it just doesn’t look right to see Piers snogging the millionairess!